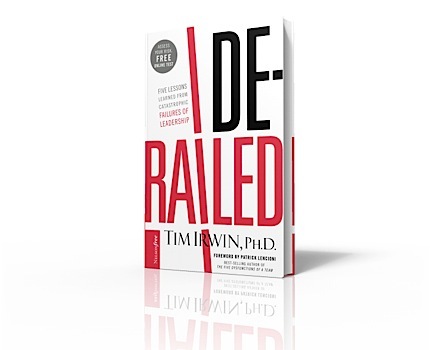 Tim Irwin's book, Derailed , is not your normal book on Leadership. He doesn't give three steps to becoming a more visionary leader. He doesn't tell the reader how to motivate the people in their organization. Instead, Irwin deals with the most overlooked aspect of leadership, the leader's character. Derailed provides six case studies of high profile CEOs who were either fired or who resigned in lieu of termination. What surprised me were the issues that cost these people their jobs. In only one of the six case studies was a moral failure involved. None of the cases involved embezzlement or misappropriation of funds. What caused the downfall of each of the leaders discussed in the book were character flaws that are often overlooked in leaders, such as arrogance, pride, a lack of self-discipline, a lack of courage, and an inability to listen to other people's ideas. Irwin ties each of the failures to a lack of one of these crucial qualities: authenticity, self-management, humility, or courage. If a leader will develop these four characteristics in their life and leadership style, they will be going a long way to insuring that they will not become derailed. Irwin makes it clear that leaders do not fall because they are not smart enough or polished enough. The leaders that he discusses are all very intelligent and have shown themselves to be competent on many levels. What caused their downfall, however, were character flaws that could not be ignored by those who employed them. What would be in your Top Three List for Leadership Character Qualities?